If you don’t have the time to read this article, this is our best money belt. 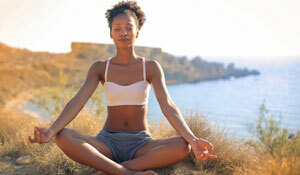 Even a seasoned traveler can easily become a victim by getting too comfortable. My husband once had his credit cards stolen in Thailand and the thieves got away with $5,000 in purchases! Fortunately, I’ve only been a victim of theft once in over eight years of full time travel, but to be honest, both our situations were completely preventable. All we had to do was lock our backpacks. This doesn’t mean that all thefts are avoidable and it certainly doesn’t mean that the world is not a safe place. It’s good to be well-informed and cautious, but please don’t feel paranoid. 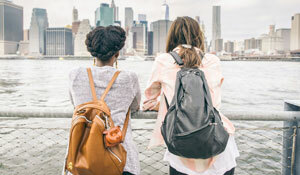 While there are reports of thefts from travelers, there is a much higher number of people who’ve never experienced anything at all so don’t let it deter you from enjoying your travels. However, the majority of incidents are due to thieves finding a convenient opportunity to steal your things. By taking a few precautions, you can avoid becoming a victim of opportunistic theft. These are my tried and tested tips on how to avoid theft while traveling! 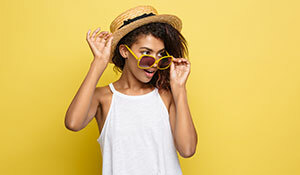 The majority of the items are meant to be worn under your clothing to securely store cash, cards, passports, and potentially other small valuables. Please note: you should not carry around your passport while sightseeing. Read this to learn how to keep your passport safe! What’s the Best Money Belt for Travel? 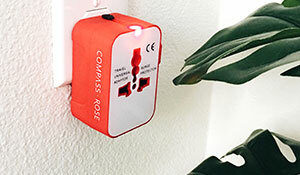 There are many variations to anti-theft accessories, as you can see in the below article. From neck pouches to hidden pockets, there’s something to meet everyone’s needs. In fact, the best option is to use a combination of items. That’s what I do. 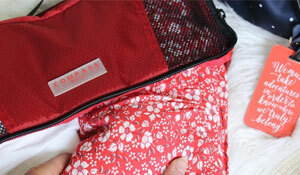 For example, you can use a bra stash to store your credit cards and cash for everyday use, then use a neck pouch or pocket underwear to store your passport on transit days, and the rest of the time, use a lockable suitcase (safe or locker) to ensure your belongings are secure inside your accommodation. 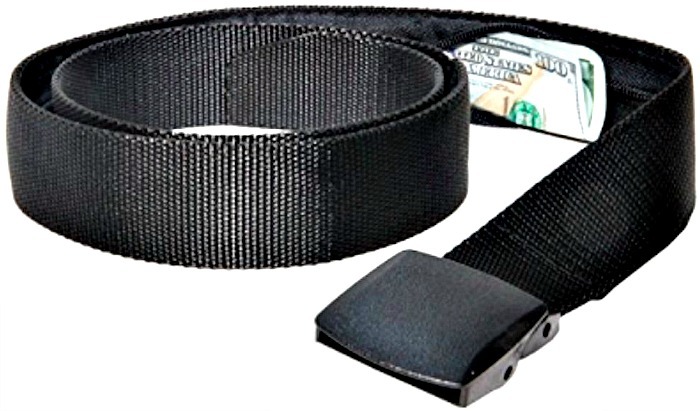 Below you’ll find a roundup of the best money belts and theft proof accessories to protect your valuables! If you’d prefer a more traditional option, these are some of the best options to store your valuables. Choose what suits you best and take fabric into consideration when purchasing. Whatever you do, DO NOT WEAR THE MONEY BELT OUTSIDE OF YOUR CLOTHING. I can’t believe how many travelers I see wearing it on the outside, advertising to thieves exactly where to find their cash. Please don’t make that mistake. It’s meant to be worn hidden under your clothing. While there are a variety of brands offering security accessories, our readers favor the beige color by Alpha Keeper and the black color by Venture 4th. They’re both made with RFID protection and water-resistant ripstop nylon. While the one by Alpha Keeper features some colorful prints, I prefer the Venture 4th style because it offers a variety of neutral colors to blend in seamlessly underneath clothing instead of brights that can show through your tops. 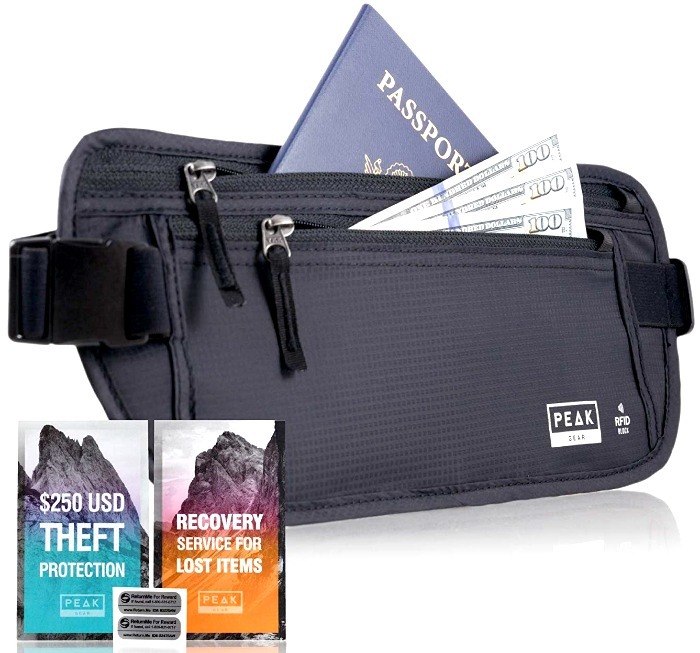 The Pack Gear thin profile money belt is unique in that it includes theft insurance and lifetime recovery service for lost items. While durable and with plenty of space for passports and credit cards, it’s lightweight and low profile so you won’t even see it under your clothing. Plus, with RFID protection, you won’t have to worry as much about identity theft! Whether you plan on exercising or hiking on your vacation or just sightseeing in the city, this StashBandz travel money belt doubles as a running belt. Double the width of a standard running waist pack, this spandex hip belt has four eight-inch wide pockets and stretches enough to accommodate larger cell phones like the iPhone Plus. The concealed zipper ensures none of your essentials fall out. 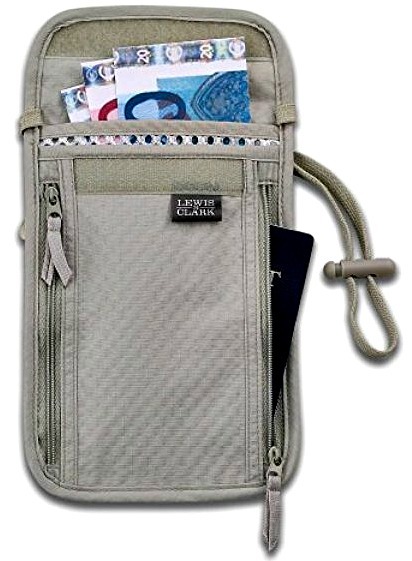 Eagle Creek is one of the most popular travel accessory brands, and their undercover money belt is a traveler-favorite. 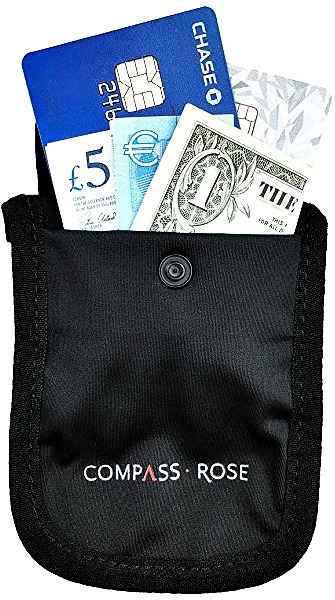 Equipped with two, separate zippered pockets, you can easily organize your currency in one pouch and other documents in another. Made from natural and soft silk, this slim money belt is comfortable to wear all day, plus the rose pink color is so cute! 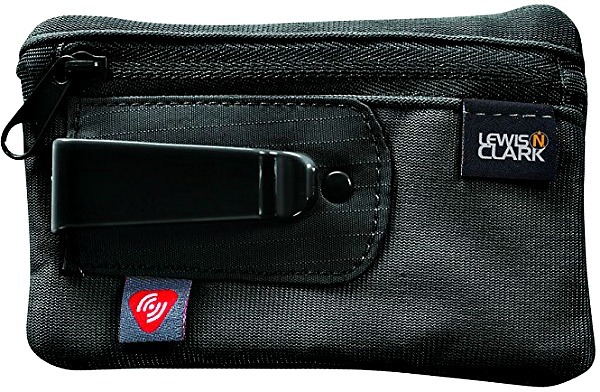 For an inexpensive money belt, you can’t go wrong with the Lewis N. Clark hidden money belt. This anti-theft waist stash features RFID-blocking technology, a special TravelDry fabric to wick away moisture, and durable rip-stop nylon with self-repairing zippers. Along with multiple compartments and a slim design, you can keep your essentials with you without the bulk! That simple product worked well until I discovered secret bra stashes and they totally changed my travel safety strategy. I recently created my own version, the Compass Rose Secret Bra Wallet. The fabric is the same as a bra so it’s soft and comfortable to wear even in the heat and humidity of Rome in the summer. This is the ONLY bra stash made with an extra long strap to fit DD+cup sizes and a range of bra bandwidths. PLUS, it’s also the only bra stash with RFID protection. Fasten it to your bra strap, on your bra band under your arm or in between your bra cups, or attach it to your belt loop tucked into your pants. You can even attach it to some underwear styles, too. Tuck it in underneath your bra for extra security – that’s how I wear mine. It’s absolutely amazing and convenient–even more so than my trusty money pouch because it also fits my credit cards. By wearing it under my arm instead of in front of my bra, it doesn’t bulge through my shirt or chafe my chest. 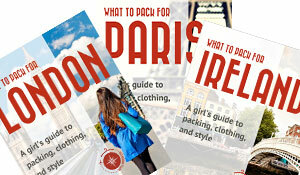 Travel Fashion Girl readers are giving this rave reviews! Buy it here! Another popular anti-theft product is the Eagle Creek Undercover Hidden Pocket that’s placed onto your belt and worn under clothing. Many people find this more comfortable than a money belt but the caveat is that you have to wear a belt in order to use it. Buy it here! Featuring a zippered hidden pocket, the Active Roots security belt is a great alternative to your regular one to keep your money and other valuables safe while on the road. Simply fold your bills and passport copies in half and slide them in the pocket with any other of your credit cards or ID’s. Buy it here! Similar to a bra stash, this secret wallet by Lewis N Clark offers an option you can clip to your waist belt. It also offers RFID protection. While their picture shows in on the outside of trousers, it seems to be better protected on the interior of your clothing. 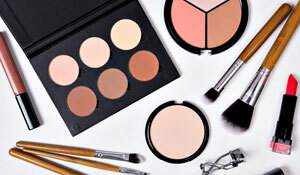 Our readers LOVE this product! The Secret Bra Wallet and this hidden travel belt wallet are two of the best selling anti-theft items. Buy it here! Another popular Lewis N Clark anti-theft product is their deluxe neck wallet. It can hold up to four passports, which is a plus if you’re traveling with your family. It also has durable ripstop fabric and a long strap so you can also wear it across your body. Buy it here! The best protection in your accommodation and during transportation rides can be as easy as locking your bag. I now use the 22″ Osprey Ozone wheeled suitcase and alternate it with the Delsey Helium Shadow for different trips. They’re both terrific bags and have built-in lockable zippers. 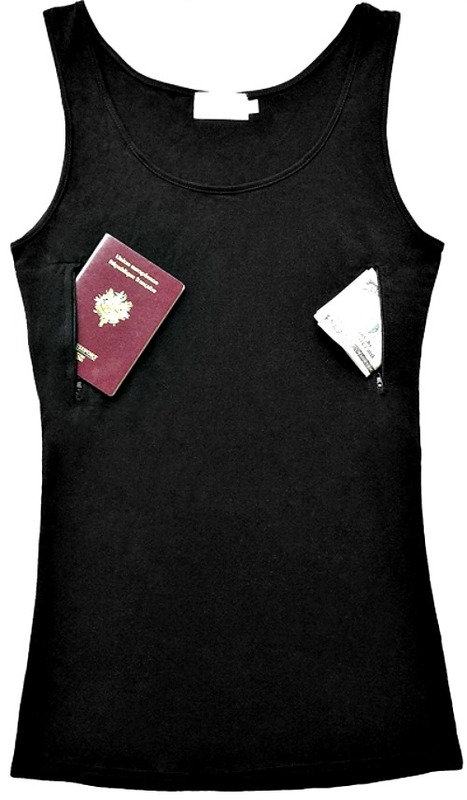 If you don’t like a money belt, stashing your passport and money in your underwear may be a better option. While traveling in El Salvador, I found a boy short style underwear with large pockets on either side of the leg. While it was a bit awkward to wear my passport over my upper leg, I only used it during transportation journeys in Central America when the probability of getting my daypack stolen seemed a bit higher. 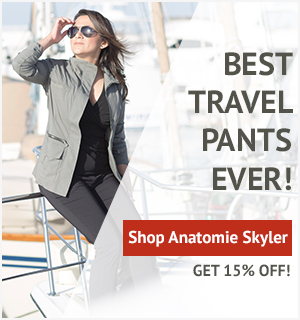 For something similar, a popular style is travel clothing with secret pockets by Clever Travel Companion. It features zippered tanks and underwear with hidden pockets. Buy it here! The Travel Bra now also offers comfortable pocket bras and underwear for women and men while Travelon has socks with secret zippers – a great option for winter! Alternately, you can also sew a pocket into your underwear. Customize your anti-theft approach based on your destination. In places like Europe and Spain, where pickpockets are common, avoid clothing and bags with open pockets, giving wandering hands easy access to your things. Coats and pants with zippers are a must! It’s possible to find clothing accessories with zippered pockets to stash a little cash. 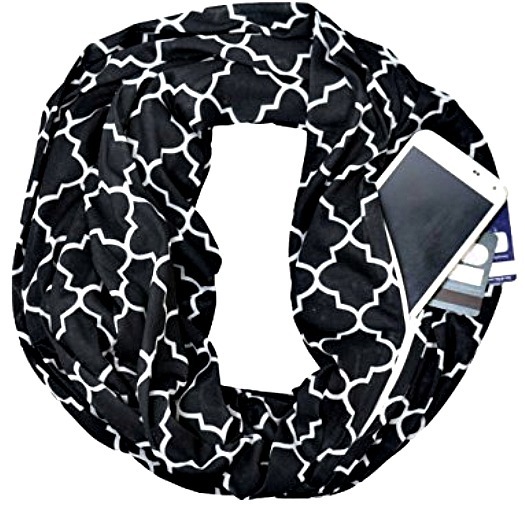 I found the above infinity scarf online. 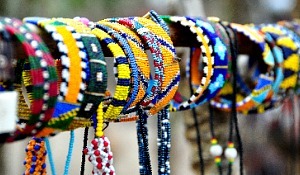 It’s affordable and available in wide variety of prints and colors. While you wouldn’t want to carry many things on your next the entire day, this may work well to store some larger bills and an emergency credit card on trips with cool to mild weather. Buy it here! Tip: The key to packing light is create a travel capsule wardrobe which can easily fit into a carryon suitcase with the help of packing cubes! Some travelers may want to take extra precaution by using anti-theft travel shoulder bags. These specialized travel purses have safety features like lockable zippers, slash-proof materials, and sturdy straps to prevent thieves from breaking in. 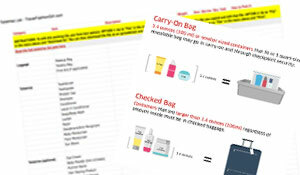 Pacsafe and Travelon are the two major brands that offer these theftproof bags but our readers rave the most about Travelon. They offer a variety of styles including travel purses that don’t necessarily look like “anti-theft purses” like their Slim Crossbody shown above. It’s part of their Signature Collection, which offers some of the best-looking styles! Buy it here! 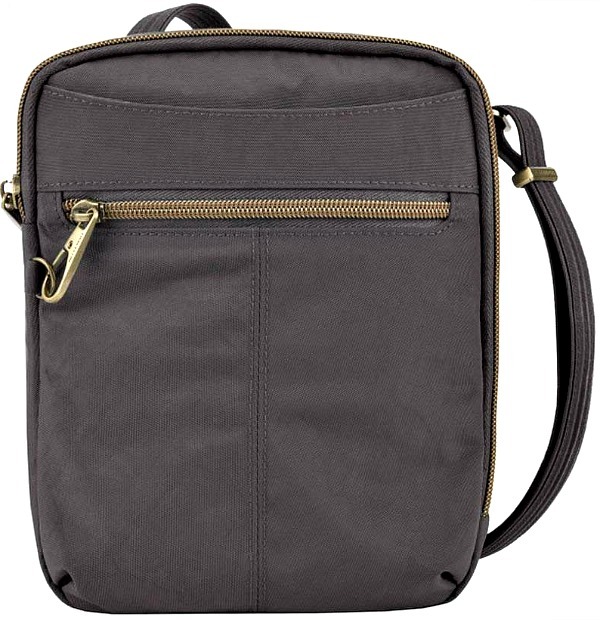 If you need more space, the best selling Travelon travel purse is the anti-theft cross body with two pockets. It has a slim design featuring slash-proof fabric, an adjustable, cut-proof shoulder strap, and zippers with a latch for extra security. It also comes with RFID blocking card slots. It retails for as low as $30 and is available in over twenty colors. Our readers favor the bag in a classic Black but two other popular options are the Midnight and Stone colors. It’s a clear winner! Buy it here! Read more about the best anti-theft travel bags for women! How Do You Use Anti-Theft Accessories? It’s important to note that anti-theft products DO NOT REPLACE YOUR NEED TO USE A WALLET. Please keep enough money for the day in your wallet and use an anti-theft product such as a money belt or bra stash to store EXTRA cash and cards only. I keep the bulk of my money in my bra stash but I keep what I need for the day in my pocket, purse, or wallet. This way, I don’t have to dig into my bra or money belt awkwardly or uncomfortably every single time I need to access money. 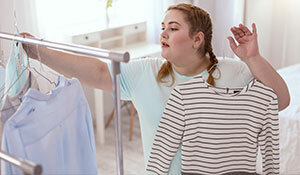 Please DO NOT dig under your clothing every time you make a purchase. That defeats the purpose of these products. I see this happen a lot. Travelers will get their money belt out and dig through everything so they can find what they need. This isn’t very safe as now everyone knows how much money you have and where you store it. It’s important to be discreet, hide it, and step aside somewhere quiet or secure if you do need to get into your anti-theft product. 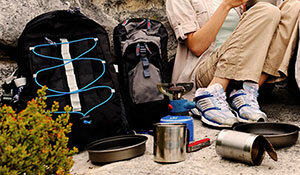 Please read my top ten tried and tested anti-theft travel tips for more information on how to properly use these items! Watch the video above for the do’s and don’ts on avoiding theft while traveling. Don’t forget travel insurance! Keep all your receipts because they’ll be necessary for insurance claims, along with a police report. Avoid sightseeing with your passport and all your money in your daypack or travel purse. Don’t go to big festivals and events with your passport and large amounts of money. Avoid leaving your passport and money unlocked in your hotel, hostel, or guesthouse. Use lockers provided by your accommodation (don’t forget one of the top 10 essentials on your backpacking checklist: travel locks). Try to only keep all your valuables on you when in transit and on transportation journeys–this is a good time to use the above gear. Make photocopies of your passport and offer it when an agency requires you to leave your passport as collateral. It may not always work, but it’s worth a try. Distribute the wealth and spread your valuables out in different places so if something does get taken, they don’t get everything. Always always always lock your backpack or suitcase, no matter how comfortable you feel in your accommodation. 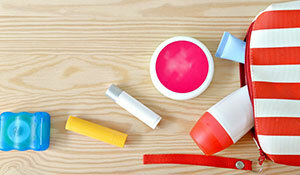 As mentioned above, these items should be used as precautions. 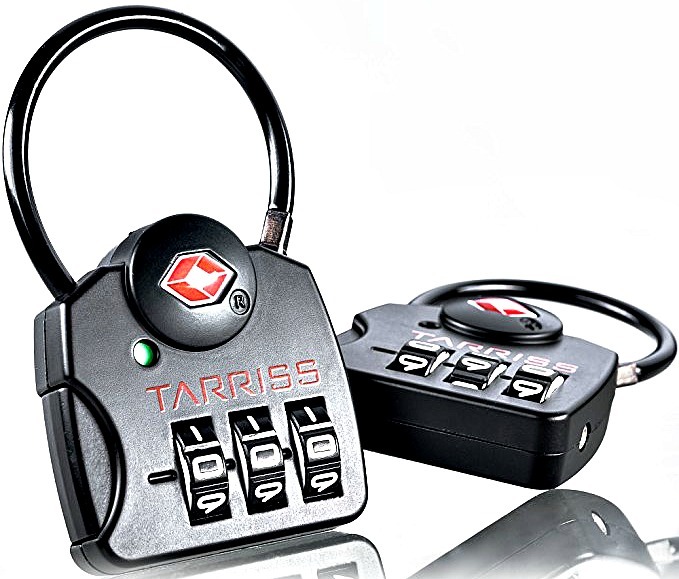 They won’t guarantee you won’t have things stolen, but they definitely improve your chances of keeping your valuables safe. It is more likely that your cards will be stolen from inside your luggage rather than someone making off with your entire suitcase or backpack, but things do happen. In cases where thieves steal entire bags, it usually happens on overnight buses–from underneath the bus or even from right under your seat while you sleep. It’s a sad part of travel, but it happens. Anti-theft travel accessories are a low price to pay versus having your cash and credit cards stolen. Travel insurance can sometimes help cover costs in case you are a victim, but it’s best to be cautious about your belongings, too. Do you travel with anti-theft travel accessories? 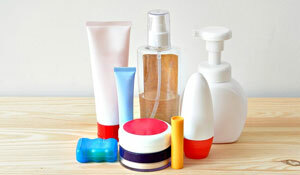 Will these Safe Travel Essentials Really Help You? 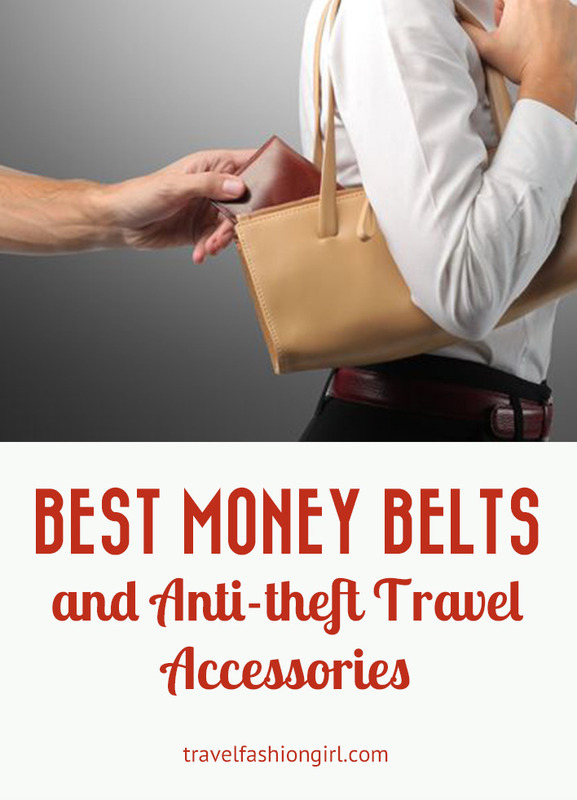 I hope you enjoyed this post on the best money belts and travel accessories. Please share it with your friends on Facebook, Twitter, and Pinterest. Thanks for reading! Another travel bra option would be the sporty Brave Betty. Good for overnight travel and when you don’t need immediate access to the contents as the storage area is inside the back of the bra. Do you have recommendation for passport storage while swimming. I’m going on a cruise. I want to swim While on shore but will need my passport to get back on the ship. One of the best items I’ve bought is a ScotteVest, I can travel with everything I might need for the day and then some without looking bulky or having a bag to manage. The best part it entering museums or other venues with bag checks….I can just skip that and walk straight in. All my valuables are safely stowed in hidden pockets, I love it! When do you wear the money belt/bra stash? put it on before airport? When going through security, is the belt/bra stash a problem? Thank you for clearing this situation up. Hi Theatta, I’ve just added a video that explains this all: https://www.travelfashiongirl.com/how-to-keep-your-passport-safe-while-traveling/ The explanation begins at the -17:20 minute mark. Ordered the travel bra however do you have recommendations for where to keep a smartphone when out and about. That obviously will not fit in the bra. I carry it in my purse or jacket pocket. I bought a waterproof case that had a clip on it. Then you can easily clip it to your belt or purse while having it in your pocket or bag. It made it easy to find to for a quick pic on the go. My friend actually had hers stolen the second day of our trip & now uses a similar case in her daily life. Great article! My husband has a great travel sling backpack from Oakley that has zipper lock capabilities. It’s a great option for men. where did you get it the bag for your husband? It’s super cute – I have it! I have the purse you listed & found it extremely hard to get items in & out. The zipper opens to far up on the purse & prevents the purse from fully opening. I tried it at home last yr before going on B2B cruises in Europe & thought it would work. But I ended up using a 31 crossbody that I threw in the suitcase at the last minute. Loved it, hated the Anti-theft Travelon Purse. I was past the return period when I arrived back home so I still have it but don’t use it….wish I could give it to another traveler as I doubt I’ll ever use it. Hi Jo, I am sorry you had that experience with the Travelon purse 🙁 but pleased you found an alternative purse which you were happy with! Let me look in to this for you! What about the Kavu bags? They are so popular with the young people. My 19 year old is studying abroad in Europe this summer and wants to take her Kavu which is a crossbody bag and she wears it in front . This is really helpful! But just a question color question, if you put your money in the bra stash, how do you get it out when you need it? Or do you keep some of it in your purse? Hi Andi, yes you always keep the amount of money you will need for the day in your purse and store the excess cash and cards in your bra stash or money belt. Great question! Hi, I’m traveling to the Dominican Republic soon. Can I get through airport security with a hidden thigh money belt on and with money in my bra? Hi Shemika! The money in your bra and thigh should be no problem with the metal detector but if security searches you they may wonder what it is. I’m sure it wouldn’t be an issue if it’s not an overly high sum. Hope you have a great trip! I carry small essentials in a BANDI belt. Soft and stretchy, it fits snug on waist or hips and can hold phone, passport, cash/cards/ID as well as other small items such as keys, lip gloss, mints, coins. Sleek no-bounce alternative to a bulky fanny pack. BANDI belts come in dozens of fun colorful prints and solid fabrics. I love it! Great tip, I’ll check them out! Another issue with travel designed gear such as purses is they look like they hide valuables. The local hoodlums look for them, usually. Have a piece of junk or run of the mill bag and the bag won’t attract undue attention. Being a redhead traveling where reds don’t typically originate (red occurs in every genetic group, but it’s incredibly rare outside Caucasian genomes), I cannot help but attract attention, even with it up or covered. Pale skin, red eyebrows. I’m an outsider, full stop. I try for gear to help me look unlikely to have nice things. And I don’t travel with a lot of nice things, to lessen the hit of any loss, mine or otherwise. I just bought an RFID money belt. It looks the same as any other belt but with the added security to protect your personal data, like credit cards for example. It stops people from being able to swipe your card without your knowledge and take money or worse your identity. I thought this was really cool and i was not aware how easy it now is for people to steal from you when walking past! RFID swiping is very, very common (at least in the states). My credit card number was stolen that way. Now I use RFID sleeves and wallets to block transmission, but the info is also swiped when handing over your card to pay at restaurants (which is what happened in my case). You can’t avoid it totally, but RFID blocking accessories are definitely a big help. Use judgement and precaution with hostel lockers. My laptop was stolen from the lockers at the Yellow Hostel in Rome. Staying in dorms can be cheap, but not safe for your belongings. My current practice is to never stay in dorms and always pring for the private room. Have you reviewed the Bra Stash yet? ?I bought one off of Amazon for my trip to Spain and am curious to hear your opinion of it. Thanks for your blog. I’ve gotten lost in it for hours and keep pinning stuff to revisit later!! I am travelling around Europe in a few months, the purse that I wanted to take doesn’t zip at the top its got a magnet closure, but it does have a ring on the inside attached to the purse. Do you think it would be safe to use zippered pouches and hook all the zippers and such to the ring inside my purse using carabiner clips? So if a thief did try and pull something out of my bag it wouldnt come loose? Or should I just look for another bag that has a zipper on it? Hi Jackie, it’s always a good idea to have a zippered closure just to be sure. However, if you plan to take this bag using large zippered pouches should be helpful. Does it have a zippered pocket for your wallet and phone? I have a Coach soft leather purse with a zipper and shoulder strap. Do you think this is sufficient for my upcoming Rome/Florence/Venice trip, or should I invest on an anti-theft bag like from Travelon? My hubby and I are travelling to Italy for the first time, so please advise. I personally carry my own purse and hold on to it tight at all times – crossbody preferred. Hope you have a great trip! A zippered purse can be made more secure by adding tiny S carbiners to the end of the zippers. Available for less than $5. Love your site! Planning to return to Europe next summer LIGHTLY packed and I appreciate all your wonderful tips. Thank you! I was wondering if you have used the Sholdit Scarf as a security precaution? Thinking about adding one to my packing list as I’ll need a cute infinity scarf for the trip. Hi Valeria, that’s great to hear! You’ll have such a much better experience packing light I promise 🙂 I haven’t personally used the scarf myself as I only stash my cash in the bra stash or money pouch. It’s served me well for almost 6 years of travel! 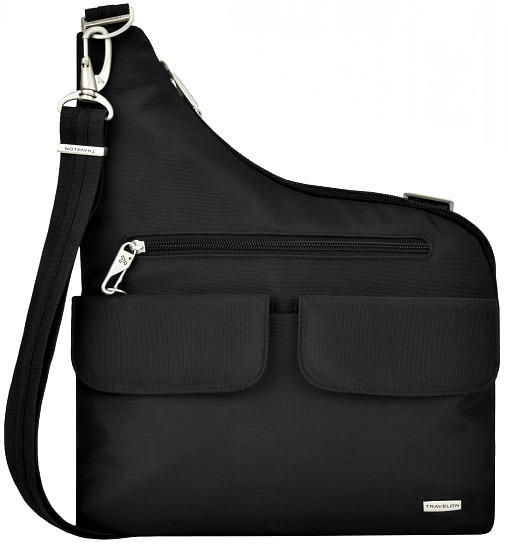 I have looked into the anti-theft shoulder bags….and they are beyond ugly. What a shame. Unfortunately, it seems as if much of the travel gear is less than attractive…I prefer to travel with a regular soft leather bag and keep my cash in my bra stash 😉 It’s worked for me for 6 years!